Kyogle accommodation, tours and attractions. Tourist guide and visitor information for Kyogle NSW, 2474, New South Wales, Australia. How to get to Kyogle, and Kyogle weather. Kyogle, known as the "Gateway to the Rainforests", and hub for the Rainforest Way road tour routes, is situated at the head waters of the Richmond River, adjacent to the World Heritage listed Border Ranges National Park. The McPherson, Tweed and Richmond Ranges lie in three of the four compass points from the town. Average rainfall is over 1100 mm so bring your brolly! With a population of just over 5000, dairying, forestry production and nature based tourism are the mainstays of the local economy. The Sydney to Brisbane rail link and the Summerland Way highway pass through Kyogle. For visitors who take a road less travelled, a stopover here provides the opportunity to experience a "typical" country town. There a number of caravan parks, a couple of hotels (pubs) and a motel providing accommodation. Kyogle Showground Reserve Trust has 16 powered sites with space for big rigs through to campers (powered or unpowered). From $10 unpowered and $20 powered site per 24 hour period. Out of town, cabins nestled in the hills, and farmstay holiday cottages and camping are available at picturesque locales like Barkersvale, Wadeville, Cougal, Dairy Flat, Lillian Rock and Gradys Creek. Featured in the "Bird Trails of Kyogle and District", Kyogle Botanical Gardens and Rainforest Reserve, located north of the town centre behind the Kyogle tennis courts (just over the Fawcett Creek Bridge), is a very pleasant area with a paved wheelchair accessible walking track, and natural surface tracks throughout the creek bank reserve. For bird watchers, the brochure features ten local birding hotspots, with directions, GPS and likely species to be seen. Copies are available at the Visitor Information Centre. Toonumbar Dam, 25 minutes drive west, and Bells Bay which has a picnic area, primitive camping and boat ramp, is a popular spot with a great reputation for fishing. Toonumbar Waters Retreat also offers very amenable group cabin accommodation and a conference centre with impressive facilities. To the north, Border Ranges Nation Park, and in the west, Richmond Range and Toonumbar National Parks have camping and picnic facilities including tables, barbecues, toilets and limited tank water, while Moore Park Nature Reserve is an example of the once extensive "Big Scrub ". 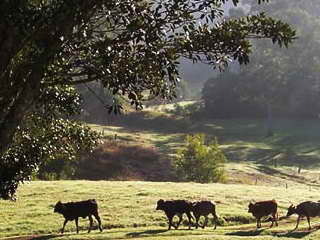 Kyogle is a great base for a variety of self drive half day and full day driving tours through the region, providing a range of experiences - from World Heritage national parks and rural Australian countryside, through to farmland and historic settlements, aboriginal history and alternative lifestyles. Available from Kyogle Vistor Information Centre and other local tourist information outlets, the "Kyogle District Scenic Drives" information sheet, details seven scenic drives around the region, with map, directions and points of interest shown. 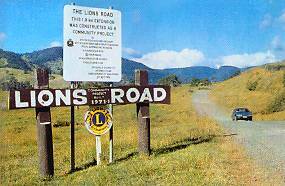 The most famous drive is the Lions Road Border Loop drive. About 30 klms north of Kyogle and 10 klms north of Wiangeree, turn right into Wilson's Avenue from the Summerland Way, follow the road, turning left at the Simes Rd "T" intersection (unless you want to detour to Border Ranges National Park) follow the main road to the top of the rim, and have your camera ready! The Lions Loop Rd parallels the Sydney - Brisbane rail line, and the picnic lookout at the top of the range is also a popular spot for train and rail buffs, who watch for the freight and passenger services travelling through the rail loop tunnel. A very informative brochure on the Loop Rd, is also readily available at local tourist outlets and Kyogle Visitor Information Centre. Cawongla is a little village 14 km east of Kyogle. The name is thought to a combination of Campbell, the area's first white settler - John Campbell, and "wonga" - an Aboriginal word for "hill". Around 300 people make up the population of the village and the surrounding district which includes Wadeville and Barkersvale. When at Cawongla be sure to make a visit to the Olde Cawongla Store and Gallery, a historic building established in 1920. The southern entrance to the Border Ranges National park is accessed via Barkersvale, or you can take a scenic loop drive around Homeleigh Mountain which offers a number of scenic lookouts over farming land toward the Border Ranges and national park. About 13 km north of Kyogle on the Summerland Way, Wiangaree is situated on the banks of the Richmond River. It is just north of Wiangaree that you can turn off for Toonumbar National Park, or the Lions Road and western entrance to the World Heritage listed Border Ranges National Park. Proclaimed in March 1907, the local economy consists largely of dairying, beef farming and horticulture activities. The General Store (and Australia Post office) has tourist information, and a greenhouse where you can enjoy a break amongst the ferns and staghorns, view relics from the past and inspect the beautiful Asian Orchid nursery. Top up your fuel and check your vehicle at the service station, where you can also view a display of bees hard at work making local honey, before heading off on scenic drives or into the parks. Picnic and toilet facilities are available at the Wiangaree lagoon, where you can sit and relax and enjoy the company of turtles, ducks and perhaps other native water birds. Another 10km north of Wiangaree is the small village of Grevillia. So named by early surveyors because of the abundance of silky oak trees (Grevillea robusta), there were three timber mills operating at one time. The Grevillia General Store has "real coffee", cold beer, restrooms and fuel. Not far from Grevillia, see if you can spot the old "snig" tracks at Sawpit Creek, where the timber (mostly Hoop pine) was hauled out with bullock teams. Getting to the region is easy: Visitors can reach Kyogle by road and rail, with air services available at Gold Coast Airport, Lismore Airport and Byron/Ballina Gateway Airport. Kyogle is approximately 740 kilometres - about 10 hours drive north from Sydney, and approximately 184 kilometres - about 2 hours drive south from Brisbane, via the Pacific Highway. Driving options include the Pacific Highway and Summerland Way in New South Wales, and Pacific Highway via Murwillumbah, and the inland Mount Lindesay Highway (via Woodenbong) route from Queensland. Or if you're seeking a shorter (30 klms or so), but many would say, more adventurous journey to Rathdowney and Brisbane, consider the border loop (Lions Loop Rd) crossing over the scenic rim. Note that this route is not suitable for trailers or caravans, being quite narrow in some spots, with 6 splash crossings and is gravel on some parts. Domestic flights operate from all capital cities to Ballina/Byron Gateway Airport (about 80 klm) and Gold Coast Airport at Coolangatta (about 98 klm). A number of international carriers servicing SE Asia, New Zealand and the Pacific fly into Gold Coast Airport. Intrastate flights are also available to Lismore Airport (approx. 50 klm), with all airports having airport car hire or other car rental services available nearby. Daily interstate coach services are available for Kyogle to Brisbane, Sydney and Melbourne, and the daily or overnight Sydney-Brisbane train service transits the town. Visit Kyogle - Transport Services Information for more transport information, including trains, coach and local bus schedules, taxis, airport, and transfer services. Northern Rivers Carpool provides locals and visitors with the opportunity to share transport in the region.